Recently I have moved down to London for a placement role as an acoustic consultant over the next year (before I go back to uni and finish my degree). Since being here I have learnt many new things about my subject as well as been getting into the London life and that as a commuter in a working job. Because of this I have obviously been spending a fair amount of time on tubes and trains around the capital, and have been getting to know the tube map quite well. Anyway, it was as I was on one of these tube journeys the other day that I had a thought – should commuters wear ear plugs? It was as I was on the Jubilee line that I noticed high noise levels, so being the acoustician I am, I pulled out my iPhone and opened up the dB meter app. As I looked at the screen I was shocked to see levels around 90-100dB. If you are not aware of the scale of deciBels, this is about the same level as a klaxon or a nightclub. For workers, there are regulations set out to employers for daily/weekly exposures that employees can experience. These are 80dB as a lower limit and 85dB as an upper limit, whereby hearing protection should be provided for the lower limit and hearing protection is mandatory at the upper limit. Note, these aren’t maximum levels that can be experienced, but average levels over a whole working day/week. Although saying this, if a commuter had an hour commute each day (to and from work) with an average level of 86dB during these periods, then they would have already reached the lower action limit of their daily noise dose! For occasional exceedances, there is a level of acceptability in this, however for continued exceedance, long term effects can occur. The image below shows a noise map for Zones 1-3 on the tube produced by London Southbank University. These levels are averages, so theoretically higher levels are possible that what is shown. 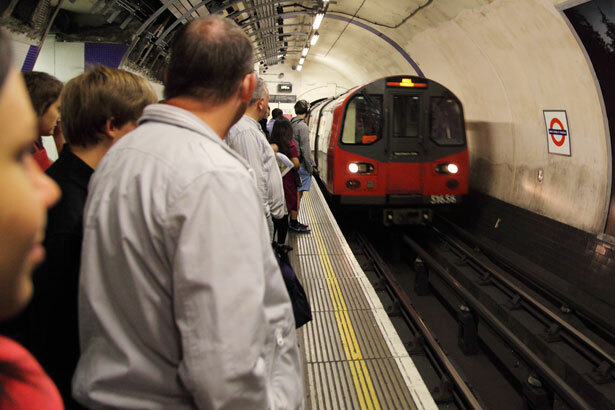 With newer trains being introduced to the underground, these levels are being reduced to a more acceptable level (see the circle line above) however should we do something about it ourselves? One option is for commuters to wear earplugs, however I don’t realistically see any chance that TfL may start handing out free earplugs or commuters wearing them any time soon! The alternative I see is simple and is already common to many commuters already – headphones. With headphones in our ears, even though we are adding extra noise, we are also reducing the background noise around us, thus reducing noise exposure (so long as we don’t have our music too loud – but that’s an issue for another day)! From what I found by looking at various sources, I reckon that a standard set of headphones can reduce ambient noise by 20-30dB (depending on quality/type) with noise-cancelling headphones giving even more attenuation. Due to an acoustic phenomenon called sound masking, we can assume that anything that is more than 10dB less than the dominant level is not clearly audible, thus making the background noise from our commute seem no problem compared to our music. There will still be elements that we do notice however, mainly bassy rumbles and thuds, but this is because headphones do not produce low frequencies like this so well. With the world around us getting noisier than ever, we need to protect our hearing as otherwise we will lose it later on in life. A daily commute is something that so many don’t even think to be a problem, when really it can be, but we’ve just learnt to live with it. What is your daily commute like, do you ever worry about it being to loud? This entry was posted in Acoustics, Interest and tagged Acoustics, Ambient Noise, Attenuation, ben southgate, Commuters, Daily exposure, Earplugs, Headphones, Jubilee Line, London, Noise, Noise Dose, Trains, Tube, Underground by Ben Southgate. Bookmark the permalink. Interesting. I wonder how loud commuting on the streets is during rush hour? Travelling by bike I wouldn’t want to wear ear plugs or earphones as if I’m about to be overtaken too closely by a 40t truck I really want to hear it coming!